How to get there: From Killarney Town follow the Kenmare Road for 1.5km. Hotel entrance is on the right. Hotel has Helipad. 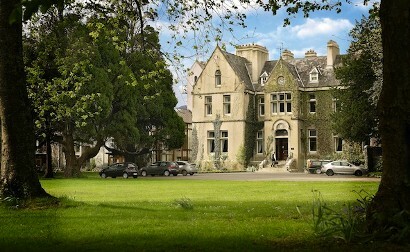 Set on the doorstep of the Lakes of Killarney, with breath taking views of the mountains beyond, is the beautiful Cahernane House Hotel which, despite having a fascinating history that goes all the way back to the War of the Roses, has certainly kept up with the times, providing their guests with a truly luxurious experience. At their fab Herbert Restaurant, Head Chef Paul O’Connor offers diners a really great selection of delectable high-end dishes to treat their taste buds, with the focus being on the best of local and seasonal produce. The room itself is dripping with historical elegance, with high ceilings, elegant drapes, chandeliers and crisp white napery adorning the tables. Starters include an Ardsallagh goats cheese parfait with summer veg, apple balsamic vinegar gel and beetroot textures; crisp, freshly caught mackerel served with mustard, watercress and flavours of gooseberry. Confit of Kerry lamb is with rosemary panko, tarragon mousse, tomato compote and jus, while delicious Castletownbere crab is paired with a sweet pea pannacotta and tasty mango sorbet, and pan-seared quail is with a foie gras pate, sherry caramel and crisp potato. Mains offer an assortment of alluring options with a confit of Killorglin pork belly being served alongside prawn cannelloni, spinach and a calvados cream; pan seared cod with Jerusalem artichoke, hazelnuts, raisins and brandade; and, for the veg-heads, a scrumptious sounding vegetable Wellington with wild mushroom, asparagus and a tomato compote. Roast rabbit saddle is with wild mushrooms, vanilla risotto, Muscat grapes and carrot, while braised beef feather blade is cooked to perfection along with pearl onions, grey oysters, a celeriac puree and a savoury jus. Leave room for desserts, which are to die for – lemon and fennel parfait with yuzu and macaroon; as well as a chocolate and caramel cremeux served with bonbons. Delish! If you’re after a more casual daytime bite with friends or family, be sure to check out their terrific Cellar Bar, located in the basement of the hotel and occupying the original wine cellar of this historical house. It’s cosy and warm, and the atmosphere here is so welcoming that it can be tough to leave. Their bar menu offers a great selection of light bights, like ham hock & apricot terrine; creamy seafood chowder; or a selection of fresh sandwiches, whilst their ‘Feeling Hungry’ section offers bigger bites like a homemade burger platter of three 4oz hunks of beef, chicken and lamb served with salad and fries; fresh spaghetti with Spillane’s smoked salmon served in a roast cherry tomato sauce with baby capers and a fennel salsa; not to mention a classic club sandwich with salad and fries. Before you go treat yourself to a tasty dessert, like a warm apple tart tatin, a lemon and raspberry mess or a warm sticky toffee pudding. With so much great food and drink at Cahernane, and a rich historical atmosphere, don’t miss out on your chance to dine like the Lord of the Manor.